I will never forget asking my nephew as I watched him growing taller and taller (he is now 6’5″), “Did that hurt?” He said he didn’t think so. But it must have. Our children have growth spurts all the time, both physical and emotional. We watch them as they struggle with those changes. Think of their struggle with those first steps, the transition from toddler to school-child, and the even larger transition from little boy or girl to teenager. All these transitions are huge and often they are accompanied by pain for our kids and for us as their parents. I remember having these V-8 moments when my kids were infants wondering why they couldn’t sleep at night when they were sleeping just fine the week before — the answer invariably was, growth spurt. So what happens when we get older? Where are our growth spurts? We may not realize that when we struggle with change we are going through our own personal growth spurts. They don’t end just because we are presumably “fully formed.” In fact, the pain and struggle continues when we get older but it may not be as obvious. And just like our kids, after all that pain and struggle we tend to forget and are just, well, somehow taller. As I travel around the world spreading the EDGE message both in my work as The Suburban Outlaw and in my coaching and training role, I can’t help but think about growth (the G in EDGE). This is on my mind this Spring because I’m seeing “live” the benefits of going out of my comfort zone last fall. 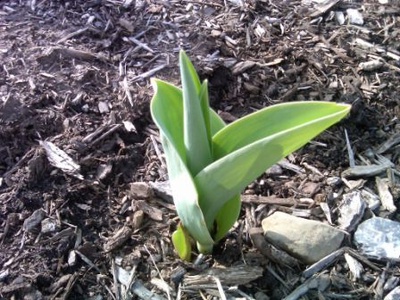 I’ve never been a gardener and this past fall we planted actual bulbs (I know, what’s so hard about that?). Now I’m watching flowers I cannot even name pop up from the dirt. The metaphor of planting something and having it struggle through the dirt to yield color and beauty months later rings true in life. I realize now I needed to live a creative life as an actor and a writer in order to bring my offering back to the business world. Cultivating my personal growth and sometimes even struggling along the path to the Actor’s EDGE has helped me to make a difference in the business world by helping business leaders to connect their hearts to the bottom-line. I struggled with the transition from lawyer to actor. I struggled as I sat writing my play with my partner, weeping sometimes at how hard it was, and I struggle today to constantly refine my EDGE message for the audiences I serve. Of course, we continue to to grow even after we’re all grown-up. But sometimes, we forget to take the leaps that came naturally and seemingly effortlessly when we were younger because now we are aware of the struggle and the pain. G: Grow out of your comfort zone. Plant a flower. Get a little taller. Decide to have a growth spurt. Don’t worry it won’t hurt a bit and if it does, just like my nephew, you’ll eventually forget all about it.